This proverb challenges us to look at ourselves with a critical eye. How often do we look at some behavior or aspect of who we are with a “justified” eye. Driving our car we are critical of others, they drive to fast, they drive to slow, how come no one uses their signal indicators, how come people never stop on a right on red turn, and on and on. But, if we do those same things we justify them; I had to speed up to make the light, I was going slow because I had to read an important text, signal indicators are for something unusual, and on and on. Generally we are easy on ourselves. It is silly to make a spiritual reflection about driving, but this simple example expands to all areas of our life. I pray plenty, church once a week makes me holy, giving to the offertory is enough toward helping the poor, and on and on. What we do is good enough, or at least better than most everyone else. So we think we are ok, our ways are straight in our eyes. 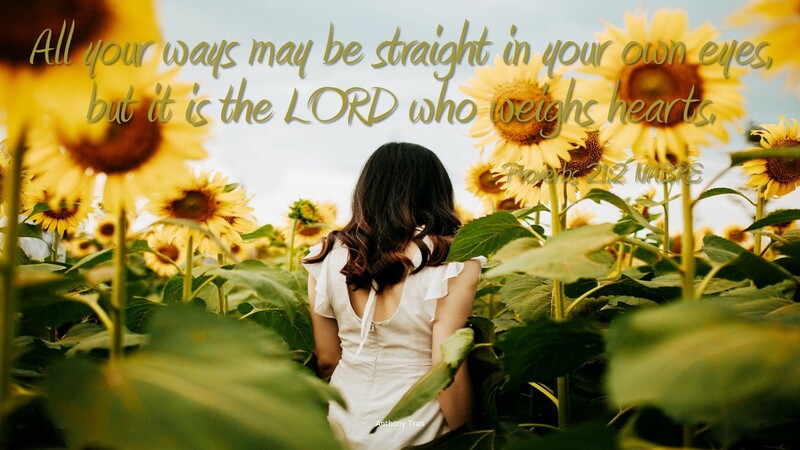 But the Lord weighs our heart. Jesus who gave his entire life to others, who spent all day every day doing the work of his Father and telling people he only does what the Father tells him, might have a different view about the things we do. No matter what we think, how we live, and what we do, we are not as holy as we think, we really are sinners. We should do more and think less of what we do do. You are not able to take a critical look at how you are doing as a Christian. We are not good judges of ourselves. It is important to have someone in your life who will be honest with you. A pastor, or spiritual director, someone who will give you the truth about your life in Christ. How are you doing as a Christian? Could you use a spiritual consultant?